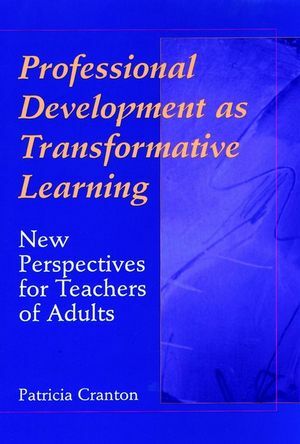 This creative and pioneering book adapts and extAnds the transformation theory of adult learning to the professional development of adult educators. Well written and easy to read, with many examples, this volume is highly recommAnded. PATRICIA CRANTON is professor of education and director of instructional development at Brock University in Ontario, Canada. She has received awards, including selection as a Distinguished Scholar at Brock University in 1991 and, in 1993, both the Ontario Confederation of University Faculty Association's Teaching Award and the Lieutenant Governor's Laurel Award for teaching excellence. Her previous books include Understanding and Promoting Transformative Learning (Jossey-Bass, 1994). 1. Preparation and Development of Adult Educators. 3. Strategies for Self-Directed Development. 5. Becoming a Transformative Learner. 6. Individual Differences in Educator Development. 7. Transformative Development in Work and Social Contexts. 8. Creating a New Vision for Professional Growth. 9. Strategies for the Developer.